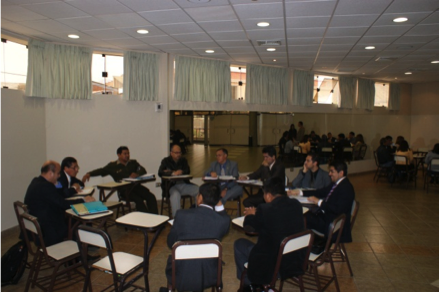 LIMA, PERU – From October 28 – 30, 2014, Peru’s National Commission on International Humanitarian Law, the Center of Studies on Justice and Human Rights and the Ministry of Justice and Human Rights held an interactive workshop to promote international standards in the use of the force among judges, prosecutors and security forces. Dr. Juan Faroppa Fontana of the National Institution of Human Rights and Office of the Ombudsman of Uruguay, and AIPR Latin American Programs Director Eugenia Carbone, represented the Latin American Network for Genocide and Mass Atrocity Prevention. During their presentations, they highlighted the importance of incorporating a focus of mass atrocity prevention in the actions and responsibilities of the judicial officials and armed and security forces in Latin America. Please contact Ms. Carbone for more information about this workshop.